I'm originally from Texas. We don't have mantels, because we don't have fireplaces. After all, who wants to turn on the heat when it's 100 degrees outside IN THE SHADE? I may be cold by nature, but no ones that cold. Or crazy. But here in Colorado, it gets cold. After all, it's 32 degrees right now and snowing. I'm absolutely FREEZING and missing my Texas winters. So of course I want to snuggle in front of the fireplace with a cup of hot chocolate and a good book. While, I enjoy the fire's glow, it's also nice to be able to enjoy the fireplace mantel as it dresses up for Halloween too. My mantel always has the Elliott wooden name pieces that I made so long ago (and showed you how HERE.) So I like to decorate around them. I tell my kids its because our family is a permanent fixture in their life and they are stuck with us always, so just work around it and deal with it. I also have some kind of picture about the mantel. I keep the frame and just change out the picture each month with a new one that I make. For October, I made a Halloween subway art printable (you can see it HERE) with my favorite fonts. I used a 50% off coupon and had Walgreens blow it up to poster size for only a few bucks. Below the subway art, I placed a ghost and a pumpkin tea light holder that I found on clearance last year at one of the dollar stores. They aren't very big and don't give off much light, but they are super cute. 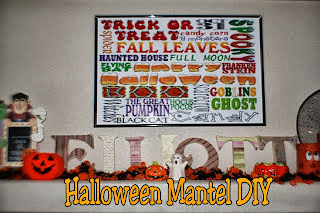 To the left side of the mantel is a pumpkin plastic canvas candy holder that I made years and years and years ago. It was probably one of my first real plastic canvas projects and even though it's lost it's lid and stem piece, it still makes an appearance every Halloween. Next to my jack o'lantern candy dish is a pumpkin mason jar that I painted a while back also. It's a large mason jar painted orange with a jack o'lantern face painted on the front. The lid is painted green and has a wooden knob as it's stem. Then I tied green curly ribbon to the stem to be the pumpkin vines. At one time, I had Christmas lights coming out of a hole I cut in the lid, but with my boys running around all the time, I hate to stretch the extension cord across the room and have them trip on it. Finally, I have a Halloween advent calendar finishing off the left side of the mantel. I was given this chalkboard calendar a few years ago since I love to collect count down calendars, so I'm not sure where you can get one. It's cute with Frankenstein, Count Dracula, and a mummy peeking out the top and has a place to count down to Halloween on it on the sign they are holding. The right side of the mantel has 3 pumpkins made out of wooden tree trucks. I made these years ago at a Church women's meeting. They were super easy to make. The wood tree is cut into 3 different sizes and painted orange color. Then I painted faces on each one of them. At one point they had little tree limb pieces painted green as stems, but those were lost 4 moves ago. I am a very symmetrical person, and everything I do has to be even, (can't you tell from when I showed you how to make the Candy bouquets? Everything was crazy even.) So I needed some height on the right side. I finally added a glitter witch hat that I will probably use for my Halloween costume this year. This way, I won't lose the hat and it looks cute for more than just one night. Finally, I found another ceramic pumpkin candy dish at Dollar tree last year. It sits on the inside of the pumpkins and brightens up that side of the mantel. I have been known to hid a few flat candies in there so I can munch when I'm sweeping the floor. No one knows they are there, so it's a good way to hide my treats in plain site. I have to admit, I'm a huge fan of how my Halloween Mantel turned out. As I sit by the fire tonight enjoying my hot chocolate, I'm going to enjoy the cold weather outside and the fact that I have a beautiful fireplace to sit by. I'm linking up at The CSI Project and THESE fun Linky Parties. Mine has to be symmetrical, too. If it's not it drives me bonkers! Ha! Cute mantel! I moved into my own place in the summer and am still busy buying furniture but can't wait to start decorating for the seasons myself! i love the idea that your family is the center and you always keep the letters. what a great example for your kids thanks for linking up to the all things pretty party! Awe, I love your mantel. The little pumpkins made of wood are adorable and I love the wall art. Thanks for sharing and for linking up to Thrifty Thursday. This is a cute mantel decoration! Thanks for linking to Less Laundry, More Linking! Hi Kim, your mantle is awesome! I especially like the wooden pumpkin set, they are so cute. Thanks for joining our party this week and sharing your decorations. I can't wait to see what you've been up to this week.